1.1 What XCrySDen can do? A menu widget is at the top of the main window. Please notice the Palette menu (small palette-like icon) at the left of File menu. A background of the render window can be set here to an arbitrary color. 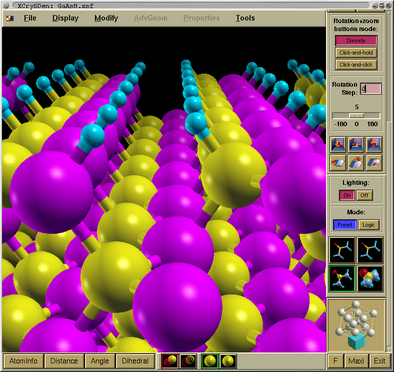 A big display area, where a portion of the GaAs surface with adsorbed hydrogen is displayed, is a render window. Its background color can be set via Palette menu (small palette-like icon) at the left of File menu. A toolbox panel is on the left side of the main window. Please note a slider at its left. With it we can drag the panel up and down, in order to reach all tools-widgets on the panel. A measure buttons (AtomInfo, Distance, Angle, Dihedral) are at the bottom of the main window. Here you can found how to measure distances, angles and dihedrals. At a very right is the Exit button. Here you can found detailed description of the XCrySDen main window. It was written for an old XCrySDen's version 0.3. The main window of the current version differs a bit, but nevertheless the document is still useful. Fullscreen mode: double-click the left mouse button. To exit from the fullscreen mode perform another double click with the left mouse button. WARNING: Lighting-Off mode can display only structure, crystal cages and nothing else !!! NOTE: I got several dozens Emails per year claiming: not able to render isosurface. And the reason is always the Lighting-Off mode. When rendering an isosurface or some other complex object (i.e. isosurface) switch to Lighting-On mode, otherwise it will not appear !!! If your graphics card isn't fast, then the rotation will be quite slow when rendering in Lighting-On mode a very complex object (hundreds of atoms, isosurfaces, etc.). In such a case, simply switch to Lighting-Off mode (this will turn off the complexity) and rotate, translate, zoom and so on until you are satisfied with the setting. Then switch back to Lighting-On mode (this will turn on the isosurface) and you will have the desired picture !!! After the installation of the XCrySDen program (the Installation instructions can be found here) we are ready to run XCrySDen for the first time. The name of XCrySDen executable is xcrysden. I suggest that you start exploring the program capabilities by running the provided examples as explained below. XCrySDen distribution provides several example files. They can be loaded via File-->XCrySDen Examples ... cascade menu. There one can choose among different provided files in several supported formats. After loading the structure, start to explore the functionality of the toolbox panel buttons. The panel is located on the left side of the main window. Try also to measure some distances or angles by clicking the corresponding measure buttons located at the bottom of the main window (the HOWTO Measure instructions can be found here). There are two ways to load the structure into XCrySDen: (i) trough File-->Open * menus (where "*" is a wildcard standing for any text), or (ii) via command line options. Execute: xcrysden --help to display all supported options. XCrySDen supports well-known XYZ and PDB file formats. 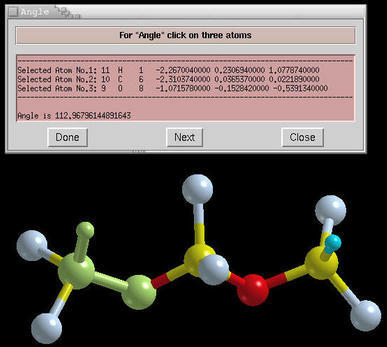 In the latter case only a subset of the file is read, namely the ATOMS section, while all others are ignored. But these file formats do not have support for crystal structures. Therefore XCrySDen has its own file format, which is called XCrySDen Structure File (XSF) format. Many other formats (like WIEN2k struct file or PWscf input file) are supported through conversion to the XSF format. Here you can find the XSF format specification. In addition, Jens Kunstmann has written an XSF-converting tool xsfConvert. Currently it can convert the data from the TB-LMTO-ASA and VASP programs to the XSF format. XCrySDen menu widget is located at the top of main window. There are the following menu-buttons: Palette, File, Display, Modify, AdvGeom, Properties, and Tools. They are shortly explained below, but the detailed description can be found here. I suggest you start by exploring various entries in the Display and Modify menus. this menu is intended for various "display" possibilities. It consists of check- and radio-buttons. 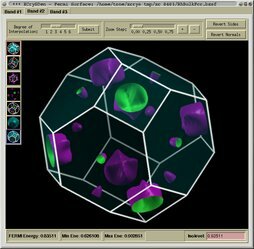 By clicking appropriate checkbuttons inside Display menu one can render: Coordinates system (XYZ base vectors are displayed at the bottom-left of the render window), Atomic symbols, Crystal cells, Forces, Wigner-Seitz cells, Molecular surface. The content displayed on the left of the figure is called Translational asymmetric unit, while the one on the right is called "nicely cut unit cell" or shortly Unit Cell. this menu is mented solely for CRYSTAL GUI. Here one can perform some property analysis. 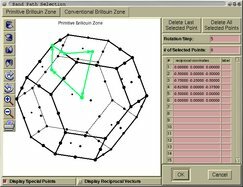 Among supported options are the plotting of (i) band widths, (ii) density-of-states, (iii) band structure (one can select th k-path inside Brillouin zone graphically), (iv) electronic densities and electrostatic potentials as 2D contours or 3D isosurfaces. A few useful tools can be found here. This includes: Color Scheme, Data-Grid, k-path Selection and Periodic Table of Elements.